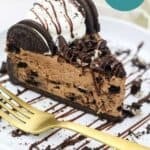 It’s hard to top my original No-Bake Oreo Cheesecake, but after several requests, I’ve made a chocolate version and it’s absolutely to-die-for. 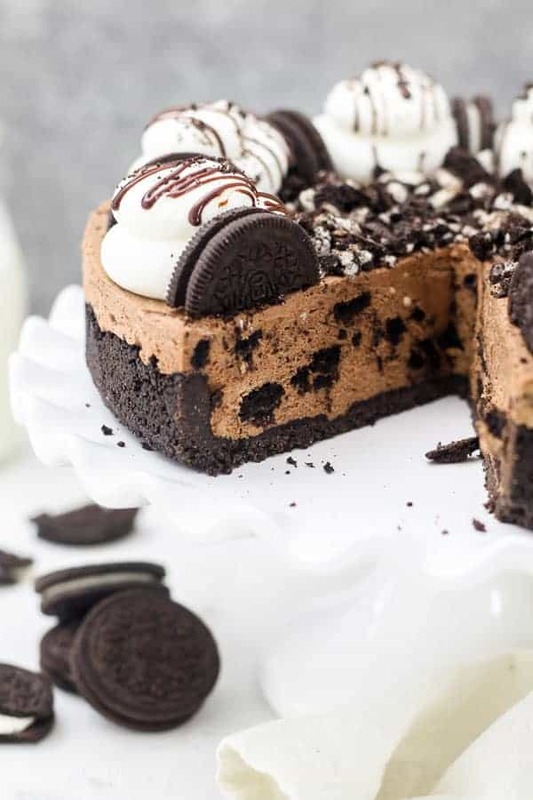 For the No-Bake Chocolate Oreo Cheesecake, we’re using a combination of cocoa powder and melted dark chocolate to make this cheesecake super chocolaty. 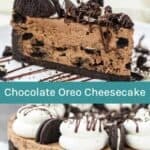 The chocolate cheesecake is creamy, but not overly rich and it’s loaded with crushed Oreos. If you’re not sure which one is better, you’ll have to make them both! 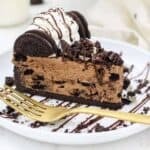 Simply put, the original Oreo cheesecake is more similar to a traditional cheesecake in taste, but if you’re like my husband, who is partial to chocolate desserts, this one might be for you. Either way, you can’t lose. 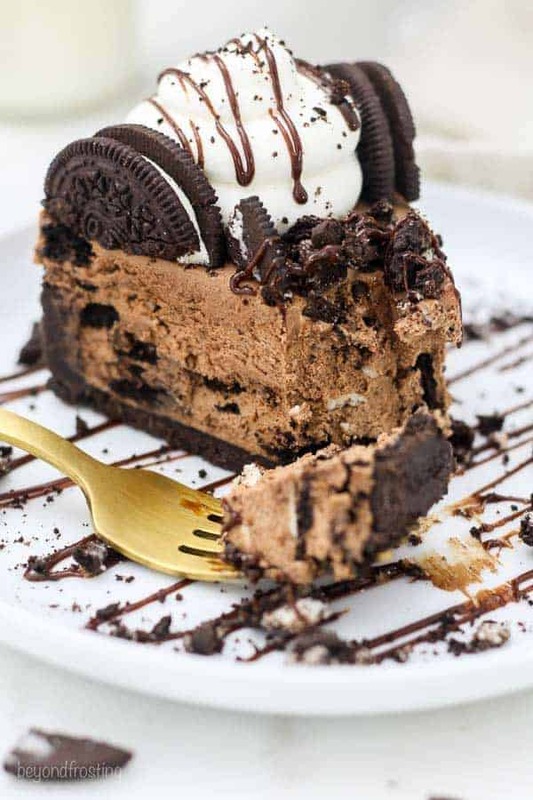 I tell you I am a sucker for Oreos that have been softened in whipped cream whether it’s a topping for an Oreo poke cake or a mousse pie. The Oreos are soft and cake-like, so they just melt in your mouth. Speaking of Oreos, I also just purchased the mega “most-stuffed” Oreos. Have you seen those, it’s 3 times the normal filling? Too much filling for me, but I had to try them. They would probably be better dipped in a big glass of milk! I am a big milk drinker, mostly with my daily coffee intake. Dairy foods provide 9 essential nutrients, including heart-healthy nutrients like calcium, potassium and magnesium. Lucky for you, there’s a lot of dairy in this cheesecake. Dairy is heart-healthy. Milk’s unique mineral trio—calcium, potassium and magnesium—is music to your heart. That’s why the American Heart association recommends 2-3 servings per day. So yeah, don’t mind me over here eating this cheesecake and sharing with my friends at the American Dairy Associate Mideast. 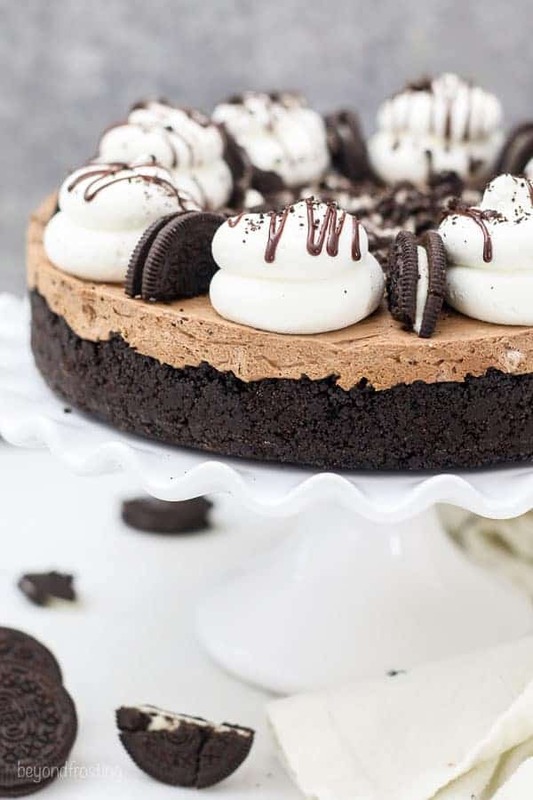 This No-Bake Chocolate Oreo Cheesecake is made without Cool Whip, and uses homemade whipped cream. However, if you’re partial to Cool Whip or need to save some time, you can certainly use Cool Whip. I also love no-bake desserts because they are great to prepare ahead of time. Sometimes they are quick and easy, and sometimes they involve more steps, but I think the whole baking a cheesecake and dealing with the water bath isn’t my first preference. 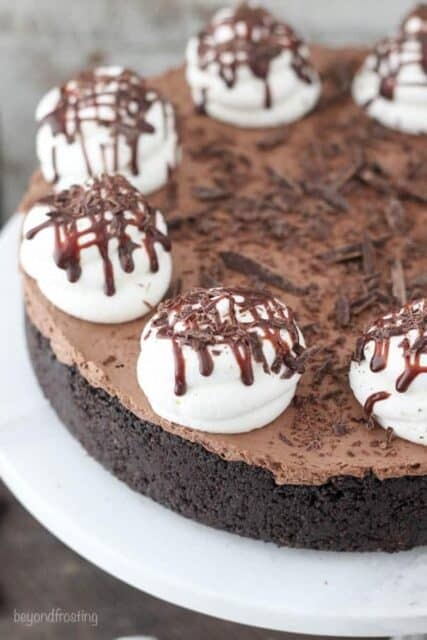 You can still make AMAZING cheesecakes using the no-bake method. There’re several steps involved to make this dessert, but it’s really quite simple, let’s break it down. 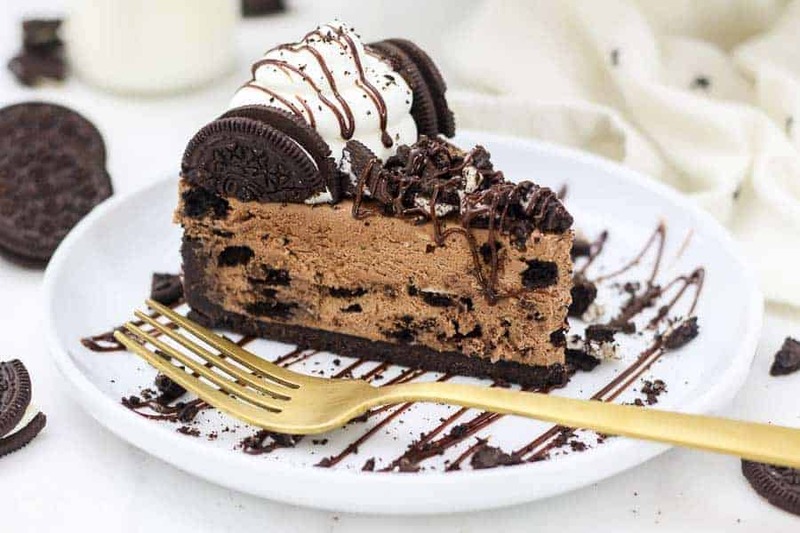 Start with an Oreo crust, prepare it first and set it aside. Next, melt your chocolate in the microwave. I microwave it at 50% power to prevent the chocolate from seizing. Set the melted chocolate aside to cool while you work on the rest of the filling. Then prepare your homemade whipped cream for your filling first. By doing this step first, you can place the prepared whipped cream in a separate bowl and set it aside for later. Then you don’t have to wash your primary mixing bowl, you can keep right on going with the rest of the recipe. If you’ve never made whipped cream, I have lots of tips for you about how to make whipped cream, so be sure to read through that post. Next, beat your cream cheese for a couple of minutes until it’s fluffy and smooth and free of any lumps. Then add the granulated sugar, cocoa powder and vanilla extract. You want to be sure these ingredients are really well combined before moving on. Be sure to scrape down the bowl and get all the cocoa powder in there. It’s time to add the melted chocolate and mix it until it’s well incorporated. You melted chocolate can be warm, just not hot. Finally, fold in the prepared whipped cream. I usually do this in two steps so it’s easier to work with. 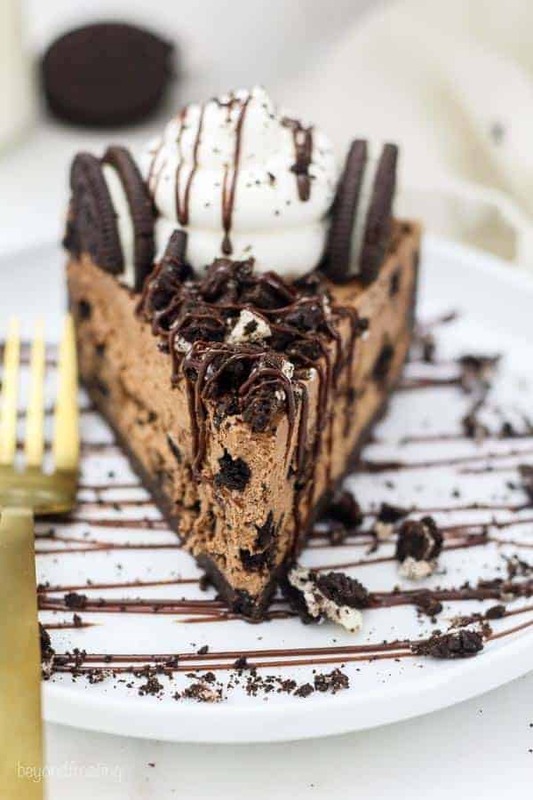 Before it’s completely mixed, go ahead and throw in your crushed Oreos and keep mixing until everything is well combined. Spoon your filling into the prepared crust and use your angled spatula to press the filling into all the nooks and crannies. 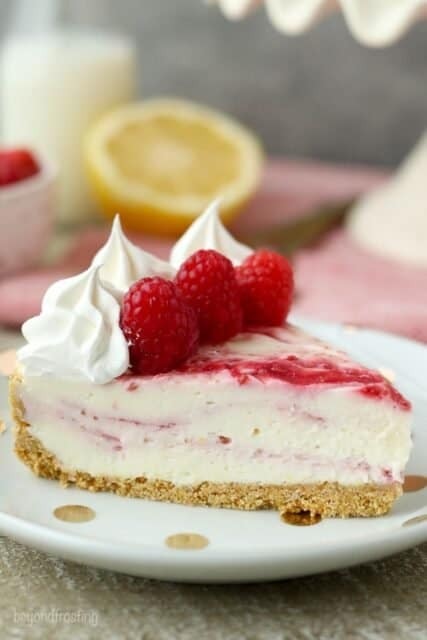 Refrigerate the cheesecake for 3-4 hours and then remove it from your springform pan and prepare the topping prior to serving. Grab an extra big fork for this one! 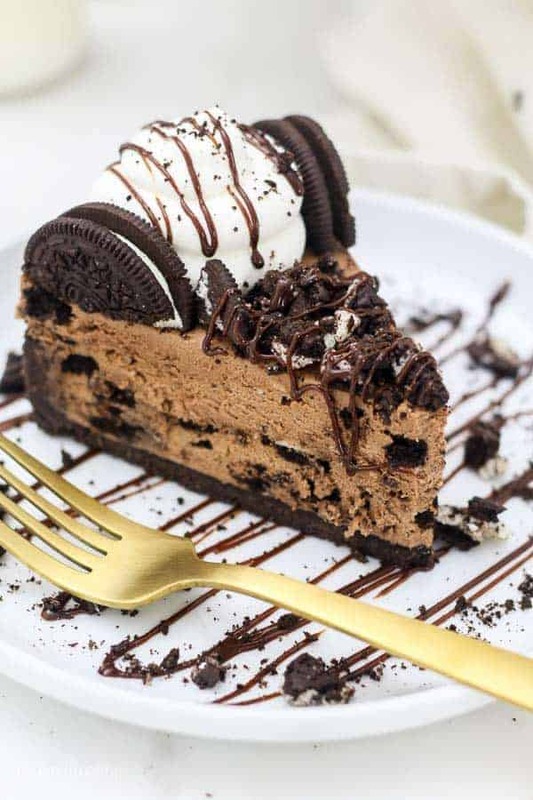 How to make an Oreo Crust? 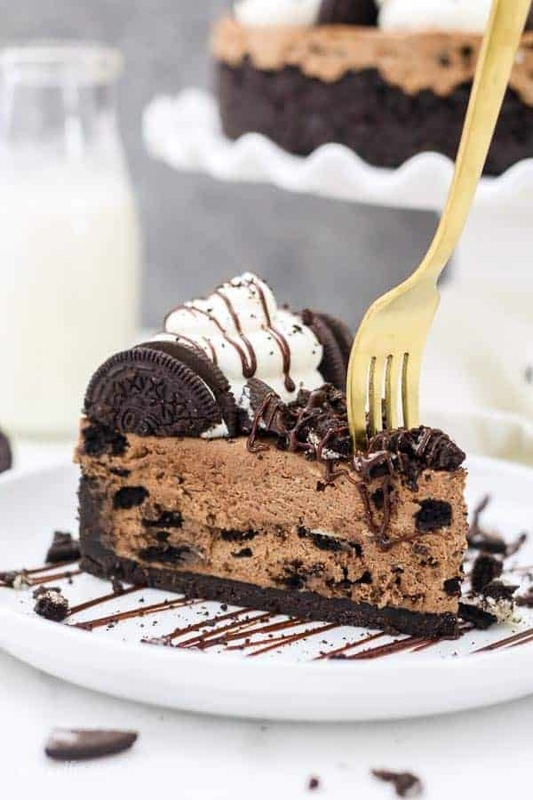 The Oreo crust is super easy! 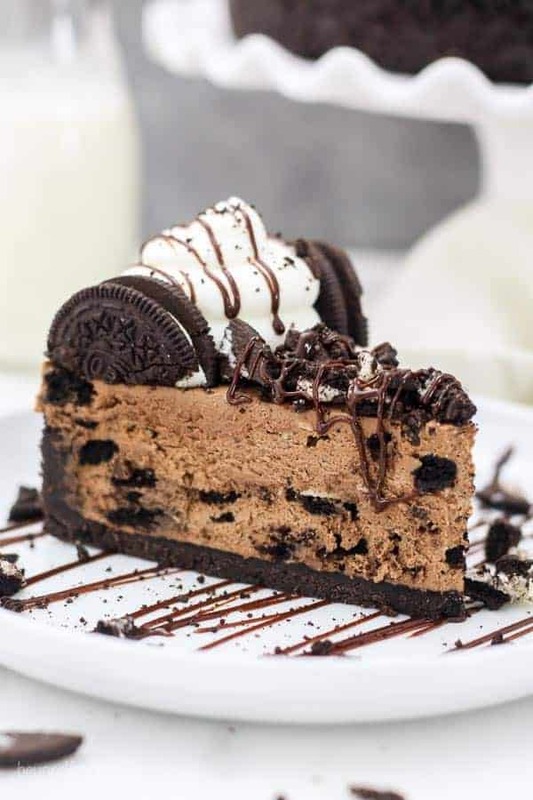 Use a food processor or blender and grind the Oreos into a fine crumb. Then combine the Oreos with a stick of melted butter and stir until the crumbs are well coated in butter. Pour the Oreo crumbs into your prepared pan. I usually like to line the bottom with parchment paper (letting it hang out the sides). I am also partial to using cake collars so I get a nice clean edge, parchment paper will also work. Otherwise you can lightly brush the sides of the pan with an oil spray so prevent the crust from sticking. Then I use a measuring cup to press the crumbs into the bottom and sides of the pan. I recommend refrigerating or freezing your crust before adding the filling, which helps prevent it from falling apart when you add the filling. For more tips and tricks, be sure to review my post for How to Make a No-Bake Crust in a Springform Pan. When making Oreo crust, do you remove the cream? No! You do not need to remove the filling! The cream in the Oreos actually helps act as a binder for the crust. If you remove the filling, the volume of your crust will be less, and it will be drier. So just go ahead and throw the whole Oreo into your food processor. Regular Oreos work best, double stuffed seem to have too much filling. Can I prepare this ahead of time? Can I freeze this cheesecake? Yes, you can prepare this up to 2 days in advance, and keep it covered in the refrigerator. Prepare the toppings right before serving. This cheesecake can also be frozen. Be sure it’s well covered and thaw overnight in the refrigerator. Again, prepare the topping before serving. Personally, I like to use high quality chocolate bars as opposed to chocolate chips. Chocolate chips are usually coated to help prevent them from melting at high temperatures and often produce a more oily chocolate when melted. In a pinch, I will use chocolate chips without any issues, but chocolate bars melt better and seem to be more smooth. 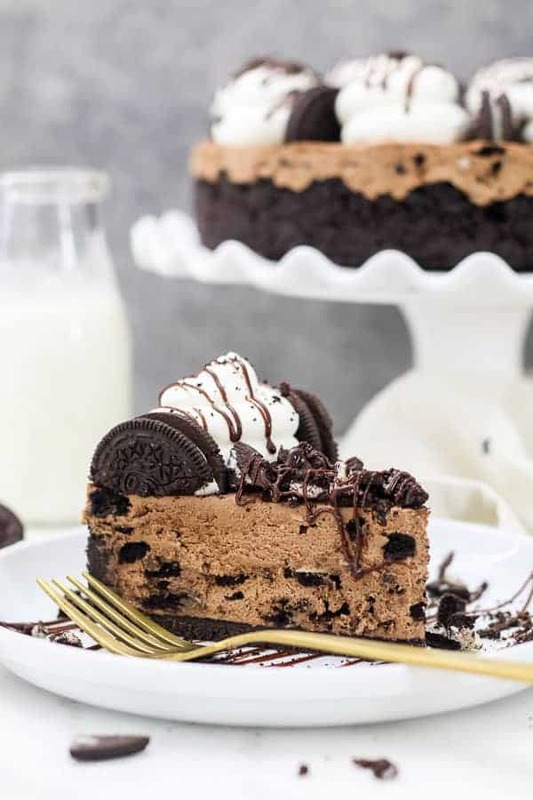 This No-Bake Chocolate Oreo Cheesecake is perfect for Valentine’s Day, parties and potlucks, or just your average Saturday night. Dairy farming is a 365-day a year job. I loved visiting the Ohio dairy farmers a couple of years ago. It’s hard work, but those farmers love their work and take great pride in what they do. For more recipes, information, dairy nutrition and to meet Ohio and West Virginia dairy farmers, visit www.Drink-MIlk.com, and follow the American Dairy Association Mideast on Facebook, Twitter, Pinterest and Instagram. Share why you love dairy this February using #DairyLove! 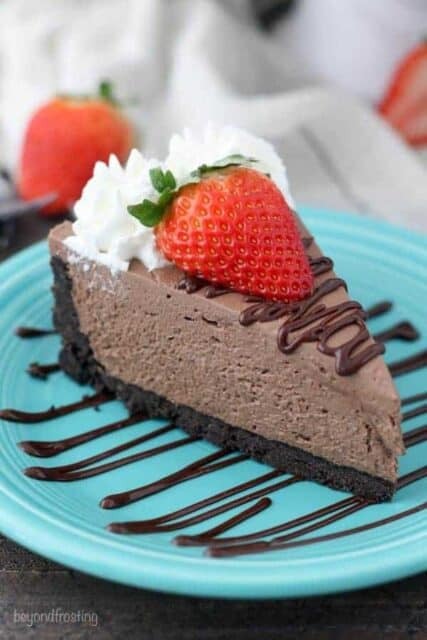 Another yummy looking cheesecake! I think I have everything on hand to make this – hopefully this week 🙂 What tip do you use to dollop the whipped cream on top?